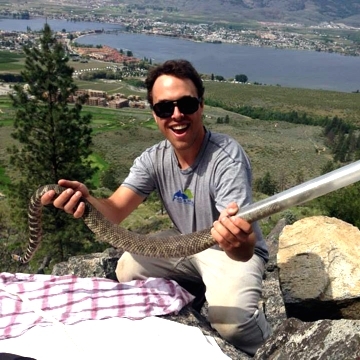 Jared became introduced to rattlesnakes as an undergraduate summer student in 2014, and he got hooked! He went on to conduct his own MSc thesis work on the same population of rattlesnakes previously studied by Emily Lomas. With his field work based in Osoyoos, British Columbia, Jared examined the response of these animals to new development, in particular shifts in seasonal movement patterns and hunting behaviour. Our partners on this project were Bellstar Hotels & Resorts, and the Nk’Mip Desert Cultural Centre. Dr. Christine Bishop of Environment Canada was co-supervisor on Jared’s thesis. Jared currently works for Environment Canada.